The Western Wall ( , translit. : ) ( , translit. : ), sometimes referred to as the Wailing Wall or simply the Kotel (lit. Wall; Ashkenazic pronunciation: Kosel), and as al-Buraaq Wall in Arabic, is an important Jewish religious site located in the Old City of Jerusalem . Just over half the wall, including its 17 courses located below street level, dates from the end of the Second Temple period, being constructed around 19 BCE by Herod the Great. The remaining layers were added from the 7th century onwards. Early Jewish texts referred to a “western wall of the Temple”, but there is doubt whether the texts were referring to today’s Western Wall or to another wall which stood within the Temple complex. The earliest clear Jewish use of the term Western Wall as referring to the wall visible today was by the 11th-century Ahimaaz ben Paltiel. The name “Wailing Wall”, and descriptions such as "wailing place" appeared regularly in English literature during the 19th century. The name Mur des Lamentations was used in French and Klagemauer in German. This term itself was a translation of the Arabic el-Mabka, or "Place of Weeping," the traditional Arabic term for the wall. This description stemmed from the Jewish practice of coming to the site to mourn and bemoan the destruction of the Temple . During the 1920s with the growing Arab-Jewish tensions over rights at the wall, the Arabs began referring to the wall as al-Buraq. This was based on the tradition that the wall was the place where Muhammad tethered his miraculous winged steed, Buraq. The Western Wall commonly refers to an exposed section of ancient wall situated on the western flank of the Temple Mount . This section faces a large plaza and is set aside for prayer. In its entirety however, the above ground portion of the Western Wall stretches for , most of which is hidden behind residential structures built along its length. Other revealed sections include the southern part of the Wall which measures approximately 80 metres and another much shorter section known as the Little Western Wall which is located close to the Iron Gate. The wall functions as a retaining wall, built to support the extensive renovations that Herod the Great carried out around 19 BCE. Herod expanded the small quasi-natural plateau on which the First and Second Temples stood into the wide expanse of the Temple Mount visible today. At the Western Wall Plaza, the total height of the Wall from its foundation is estimated at , with the exposed section standing approximately high. The Wall consists of 45 stone courses, 28 of them above ground and 17 underground. The first seven visible layers are from the Herodian period. This section of wall is built from enormous meleke limestone stones, possibly quarried at either Zedekiah's Cave situated under the Muslim Quarter of the Old City or at Ramat Shlomo four kilometers northwest of the Old City. Most of them weigh between two and eight tons each, but others weigh even more, with one extraordinary stone located in the northern section of Wilson's Arch measuring 13 metres and weighing approximately 570 tons. Each of these stones is surrounded by fine-chiseled borders. The margins themselves measure between five and twenty centimetres wide, with their depth measuring 1½ centimetres. In the Herodian period, the upper ten metres of wall were one metre thick and served as the other wall of the double colonnade of the plateau. This upper section was decorated with pilasters, the remainder of which were destroyed at the beginning of the seventh century when the Byzantines reconquered Jerusalem from the Persians and their Jewish allies in 628. The next four layers were added by Umayyads in the seventh century. The next fourteen layers are from the Ottoman period and their addition is attributed to Sir Moses Montefiore who in 1866 arranged that further layers be added “for shade and protection from the rain for all who come to pray by the holy remnant of our Temple”. The top three layers were placed by the Mufti of Jerusalem before 1967. According to the Tanakh, Solomon's Temple was built atop the Temple Mount in the 10th century BCE and destroyed by the Babylonians in 586 BCE. The Second Temple was completed and dedicated in 516 BCE. In around 19 BCE Herod the Great began a massive expansion project on the Temple Mount. He artificially expanded the area which resulted in an enlarged platform. Today's Western Wall formed part of the retaining perimeter wall of this platform. Herod's Temple was destroyed by the Roman Empire, along with the rest of Jerusalem, in 70 CE during the First Jewish-Roman War. In the early centuries of the Common Era, after the Roman defeat of the Bar Kokhba revolt in 135 CE, Jews were banned from Jerusalem. There is some evidence that Roman emperors in the 2nd and 3rd centuries did permit them to visit the city to worship on the Mount of Olives and sometimes on the Temple Mount itself. When the empire became Christian under Constantine I, they were given permission to enter the city once a year, on the ninth day of the month of Av, to lament the loss of the Temple at the wall. The Bordeaux Pilgrim, written in 333 CE, suggests that it was probably to the perforated stone or the Rock of Moriah, "to which the Jews come every year and anoint it, bewail themselves with groans, rend their garments, and so depart". This was because an Imperial decree from Rome barred Jews from living in Jerusalem. Just once per year they were permitted to return and bitterly grieve about the fate of their people. Comparable accounts survive, including those by the Church Father, Gregory of Nazianzus and by Jerome in his commentary to Zephaniah written in the year 392 CE. In the 4th century, Christian sources reveal that the Jews encountered great difficulty in buying the right to pray near the Western Wall, at least on the 9th of Av. In 425 CE, the Jews of the Galilee wrote to Byzantine empress Aelia Eudocia seeking permission to pray by the ruins of the Temple. Permission was granted and they were officially permitted to resettle in Jerusalem. There are several Jewish authors of the 10th and 11th centuries, e.g., Aaron ben Meïr, Samuel ben Paltiel, Solomon ben Judah and others, who write about the Jews resorting to the Western Wall for devotional purposes. The Scroll of Ahimaaz, written in 1050 CE, distinctly describes the Western Wall as a place of prayer for the Jews. Shortly before the Crusader period a synagogue stood at the site. Issac Heilo, a Jewish traveler writing in the year 1333, talks of an Arab king who conquered Palestine from the Christians. (He possibly refers to the capture of Jerusalem by Umar in 637.) The king had made an oath that should he succeed in conquering Jerusalem, he would restore the ruins of the Temple. After his victory, he sought out the ruins, but they had been hidden beneath heaps of rubbish. An old man approached the king saying “I will tell you where the Temple lies, but I want you to swear that you will leave us the Western Wall.” After promising, the king was shown where the ruins lay buried. The king ordered the place be cleared and “built a magnificent mosque and left the Western Wall for the Jews, who resorted there to pray.” Cheilo also noted that "It is this Western Wall which stands before the temple of Omar ibn al Khattab, and which is called the Gate of Mercy. The Jews resort thither to say their prayers, as Rabbi Benjamin has already related. Today, this wall is one of the seven wonders of the Holy City." He refers to Benjamin of Tudela who, during the late Crusader Period in around 1167 CE, wrote that "In front of this place is the Western Wall, which is one of the walls of the Holy of Holies. This is called the Gate of Mercy, and hither come all the Jews to pray before the Wall in the open court". Shortly after the Siege of Jerusalem, in 1193, Saladin’s son and successor al-Afdal established the land adjacent to the wall as a charitable trust. It was named after an important mystic Abu Madyan Shu'aib and dedicated to Moroccan settlers who had taken up residence there. Houses were built only four metres away from the wall. The first mention of the Islamic tradition that Buraq was tethered at the site is from the 14th century. A manuscript by Ibn Furkah, (d. 1328), refers to Bab al-Nab, an old name for a gate along the southwestern wall of the Haram al-Sharif. Rabbi Obadiah of Bertinoro writing in 1488, states "the Westen Wall, part of which is still standing, is made of great, thick stones, larger than any I have seen in buildings of antiquity in Rome or in other lands." In 1517 the Turkish Ottoman Empire under Selim I conquered Jerusalem from the Mamluks who had held it since 1250. The Ottomans had a benevolent attitude towards the Jews, having welcomed thousands of Jewish refugees who had recently been expelled from Spain by Ferdinand II of Aragon and Isabella of Castile in 1492. Sultan Suleiman the Magnificent was so taken with Jerusalem and its plight that he ordered a magnificent fortress-wall built around the entire city, today's Old City wall. ”I have been told that in the day of Sultan Suleiman the site of the Temple was not known and the Sultan had every corner of Jerusalem searched for it. One day the man in charge of the work, despairing after much searching and inquiring in vain, saw a woman coming with a basket of rubbish and filth upon her head. In the second half of the 16th century, Suleiman the Magnificent gave the Jews rights to worship at the Western Wall and had his court architect Sinan build an oratory for them there. In 1625 arranged prayers at the Wall are mentioned for the first time by a scholar whose name has not been preserved. Rabbi Gedaliah of Semitizi, who went to Jerusalem in the year 1699, writes that scrolls of the Law were brought to the Wall on occasions of public distress and calamity. "Jews' Place of Wailing, 1844". ”This wall is visited by all our brothers on every feast and festival; and the large space at its foot is often so densely filled up, that all cannot perform their devotions here at the same time. It is also visited, though by less numbers, on every Friday afternoon, and by some nearly every day. Over time the increased numbers of people gathering at the site resulted in tensions between the Jewish visitors who wanted easier access and more space, and the residents, who complained of the noise. This gave rise to Jewish attempts at gaining ownership of the land adjacent to the Wall. In the late 1830s a wealthy Jew named Shemarya Luria attempted to purchase houses near the Wall, but was unsuccessful, as was Jewish sage Abdullah of Bombay who tried to purchase the Western Wall in the 1850s. In 1869 Rabbi Hillel Moshe Gelbstein settled in Jerusalem. He arranged that benches and tables be brought to the Wall on a daily basis for the study groups he organised and the minyan which he led there for years. He also formulated a plan whereby some of the courtyards facing the Wall would be acquired, with the intention of establishing three synagogues — one each for the Sephardim, the Hasidim and the Perushim. He also endeavoured to re-establish an ancient practice of “guards of honour”, which according to the mishnah in Middot, were positioned around the Temple Mount. He rented a house near the Wall and paid men to stand guard there and at various other gateways around the mount. However this set-up lasted only for a short time due to lack of funds or because of Arab resentment. In 1877 the Mufti of Jerusalem accepted a Jewish offer to buy the Moroccan Quarter, but a dispute within the Jewish community prevented the agreement from going ahead. In 1887 a promising attempt was made by Baron Rothschild who conceived a plan to purchase and demolish the Moroccan Quarter as “a merit and honor to the Jewish People.” The proposed purchase was considered and approved by the Ottoman Governor of Jerusalem, Rauf Pasha, and by the Mufti of Jerusalem, Mohammed Tahir Husseini. Even after permission was obtained from the highest secular and Muslim religious authority to proceed, the transaction was shelved after the authorities insisted that after demolishing the quarter no construction of any type could take place there, only trees could be planted to beautify the area. Additionally the Jews would not have full control over the area. This meant that they would have no power to stop people from using the plaza for various activities, including the driving of mules, which would cause a disturbance to worshippers. Other reports place the scheme's failure on Jewish infighting as to whether the plan would foster a detrimental Arab reaction. In 1895 Hebrew linguist and publisher Rabbi Chaim Hirschensohn became entangled in a failed effort to purchase the Western Wall and lost all his assets. Even the attempts of the Palestine Land Development Company to purchase the environs of the Western Wall for the Jews just before the outbreak of World War I never came to fruition. In the first two months following the Ottoman Empire’s entry into the First World War, the Turkish governor of Jerusalem, Zakey Bey, offered to sell the Moroccan Quarter, which consisted of about 25 houses, to the Jews in order to enlarge the area available to them for prayer. He requested a sum of £20,000 which would be used to both rehouse the Muslim families and to create a public garden in front of the Wall. However, the Jews of the city lacked the necessary funds. A few months later, under Muslim Arab pressure on the Turkish authorities in Jerusalem, Jews became forbidden by official decree to place benches and light candles at the Wall. This sour turn in relations was taken up by the Chacham Bashi who managed to get the ban overturned. c.1560 Suleiman the Magnificent Official recognition of the right of Jews to pray by the Wall. 1889* Abdul Hamid II That there shall be no interference with the Jews' places of devotional visits and of pilgrimage, that are situated in the localities which are dependent on the Chief Rabbinate, nor with the practice of their ritual. 1893* Confirming firman of 1889. 1909* Confirming firman of 1889. 1911 Administrative Council of the Liwa Prohibiting the Jews from certain appurtenances at the Wall. In December 1917, British forces under Edmund Allenby captured Jerusalem from the Turks. Allenby pledged "that every sacred building, monument, holy spot, shrine, traditional site, endowment, pious bequest, or customary place of prayer of whatsoever form of the three religions will be maintained and protected according to the existing customs and beliefs of those to whose faith they are sacred". "The acceptance of the proposals, had it been practicable, would have obviated years of wretched humiliations, including the befouling of the Wall and pavement and the unmannerly braying of the tragi-comic Arab band during Jewish prayer, and culminating in the horrible outrages of 1929"
In early 1920, the first Jewish-Arab dispute over the Wall occurred when the Muslim authorities were carrying out minor repair works to the Wall’s upper courses. The Jews, while agreeing that the works were necessary, appealed to the British that they be made under supervision of the newly formed Department of Antiquities, because the Wall was an ancient relic. In 1926 another abortive effort was made by Palestine Zionist Executive, Colonel F. H. Kisch, who envisaged buying the whole area adjacent to the Wall in order to create an open space with seats for aged worshippers to sit on. In 1928 the Zionist Organisation reported that John Chancellor, High Commissioner of Palestine, believed that the Western Wall should come under Jewish control and wondered “why no great Jewish philanthropist had not bought it yet”. In 1922, a status quo agreement issued by the mandatory authority forbade the placing of benches near the Wall. The last occurrence of such a ban was in 1915, but the Ottoman decree was soon retracted after intervention of the Chacham Bashi. In 1928 the District Commissioner of Jerusalem, Edward Kitrutch, acceded to an Arab request to implement the ban. This led to a British officer being stationed at the Wall making sure that elderly Jews were prevented from using chairs. In practice, a flexible modus vivendi had emerged and such screens had been put up from time to time when large numbers of people gathered to pray. On 28 September 1928, the Day of Atonement, British police resorted to forcefully removing a screen used to separate men and women at prayer. Women who tried to prevent the screen being dismantled were beaten by the police who used pieces of the broken wooden frame as clubs. Chairs were then pulled out from under elderly worshippers. The episode made international news and Jews world over objected to the British action. The Chief Rabbi of Jerusalem issued a letter on behalf of the Edah HaChareidis and Agudas Yisroel strongly condemning the desecration of the holy site. Various communal leaders called for a general strike. A large rally was held in the Etz Chaim Yeshiva, following which an angry crowd attacked the local police station in which they believed the British officer involved in the fiasco was sheltering. Commissioner Kitrutch described the screen as violating the Ottoman status quo that forbade Jews from making any construction in the Western Wall area. He informed the Jewish community that the removal had been carried out under his orders after receiving a complaint from the Supreme Muslim Council. The Arabs were concerned that the Jews were trying to extend their rights at the wall and with this move, ultimately intended to take possession of the al Aqsa Mosque . The British government issued an announcement explaining the incident and blaming the Jewish beadle at the Wall. It stressed that the removal of the screen was necessary, but expressed regret over the ensuing events. A widespread Arab campaign to protest against presummed Jewish intentions and designs to take possession of the Al Aqsa Mosque swept the country and a "Society for the Protection of the Muslim Holy Places” was established. The Vaad Leumi responding to these Arab fears declared in a statement that: We herewith declare emphatically and sincerely that no Jew has ever thought of encroaching upon the rights of Moslems over their own Holy places, but our Arab brethren should also recognise the rights of Jews in regard to the places in Palestine which are holy to them. The committee also demanded that the British administration expropriate the wall for the Jews. From October 1928 onward, Mufti Amin al-Husayni organised a series of measures to demonstrate the Arabs' exclusive claims to the Temple Mount and its environs. He ordered new construction next to and above the Western Wall. The British granted the Arabs permission to convert a building adjoining the Wall into a mosque and to add a minaret. A muezzin was appointed to perform the Islamic call to prayer and Sufi rites directly next to the Wall. These were seen as a provocation by the Jews who prayed at the Wall. The Jews protested and tensions increased. In the summer of 1929, the Mufti ordered an opening be made at the southern end of the alleyway which straddled the Wall. The former cul-de-sac became a thoroughfare which led from the Temple Mount into the prayer area at the Wall. Mules were herded through the narrow alley, often dropping excrement. This, together with other construction projects in the vicinity, and restricted access to the Wall, resulted in Jewish protests to the British, who remained indifferent. On August 14, 1929, after attacks on individual Jews praying at the Wall, 6,000 Jews demonstrated in Tel Aviv, shouting “The Wall is ours.” The next day, the Jewish fast of Tisha B'Av, 300 youths raised the Zionist flag and sang the Zionist anthem at the Wall. The day after, on August 16, an organized mob of 2,000 Muslim Arabs descended on the Western Wall, injuring the beadle and burning prayer books, liturgical fixtures and notes of supplication. The rioting spread to the Jewish commercial area of town and was followed a few days later by the infamous Hebron massacre. In 1930, in response to the 1929 riots, the British Government appointed a commission "to determine the rights and claims of Muslims and Jews in connection with the Western or Wailing Wall". The League of Nations approved the commission on condition that the members were not British. To give recognition to the immemorial claim that the Wailing Wall is a Holy Place for the Jews, not only for the Jews in Palestine, but also for the Jews of the whole world. To decree that the Jews shall have the right of access to the Wall for devotion and for prayers in accordance with their ritual without interference or interruption. To decree that it shall be permissible to continue the Jewish services under the conditions of decency and decorum characteristic of a sacred custom that has been carried on for many centuries without infringement upon the religious rights of others. To decree that the drawing up of any regulations that may be necessary as to such devotions and prayers, shall be entrusted to the Rabbinate of Palestine, who shall thus re-assume full responsibility in that matter, in discharge of which responsibility they may consult the Rabbinate of the world. To suggest, if the Commissioners approve of the plan, to the Mandatory Power that it should make the necessary arrangements by which the properties now occupied by the Moghrabi Waqf might be vacated, the Waqf authorities accepting in lieu of them certain new buildings to be erected upon some eligible site in Jerusalem, so that the charitable purpose, for which this Waqf was given, may still be fulfilled. ”Being judged before you today stands a nation that has been deprived of everything that is dear and sacred to it from its emergence in its own land – the graves of its patriarchs, the graves of its great kings, the graves of its holy prophets and, above all, the site of its glorious Temple. Everything has been taken from it and of all the witnesses to its sanctity, only one vestige remains – one side of a tiny portion of a wall, which, on one side, borders the place of its former Temple. The Commission concluded that the wall, and the adjacent pavement and Moroccan Quarter, were solely owned by the Muslim Waqf. However, Jews had the right to "free access to the Western Wall for the purpose of devotions at all times", subject to some stipulations that limited which objects could be brought to the Wall and forbade the blowing of the shofar, which was made illegal. Muslims were forbidden to disrupt Jewish devotions by driving animals or other means. Yitzchak Orenstein, who held the position of Rabbi of the Kotel, recorded in April 1930 that “Our master, Rabbi Yosef Chaim Sonnenfeld came to pray this morning by the Kosel and one of those present produced a small chair for the Rav to rest on for a few moments. However, no sooner had the Rav sat down did an Arab officer appear and pull the chair away from under him.” During the 1930s, at the conclusion of Yom Kippur, young Jews persistently flouted the shofar ban each year and blew the shofar resulting in their arrest and prosecution. They were usually fined or sentenced to imprisonment for three to six months. During the 1948 Arab-Israeli War the Old City together with the Wall was captured by Jordan. Article VIII of the 1949 Armistice Agreement provided for Israeli Jewish access to the Western Wall. However for the following nineteen years, despite numerous requests by Israeli officials and Jewish groups to the United Nations and other international bodies to attempt to enforce the armistice agreement, Jordan refused to abide by this clause. Some sources claim Jews could only visit the wall if they travelled through Jordan (which was not an option for Israelis) and did not have an Israeli visa stamped in their passports. Others say Jordan even barred non-Israeli Jews, demanding that tourists present a certificate of baptism before a visa would be granted. Only Jordanian soldiers and tourists were to be found there. A vantage point on Mount Zion , from where the Wall could be viewed, became the place where Jews gathered to pray. For thousands of pilgrims, the mount, being the closest location to the Wall under Israeli control, became a substitute site for the traditional priestly blessing ceremony which takes place on the Three Pilgrimage Festivals. ”There was one moment in the Six-Day War which symbolized the great victory: that was the moment in which the first paratroopers - under Gur's command - reached the stones of the Western Wall, feeling the emotion of the place; there never was, and never will be, another moment like it. Nobody planned it in advance. Nobody prepared it and nobody was prepared for it; it was as if Providence had directed the whole thing: the paratroopers weeping - loudly and in pain - over their comrades who had fallen along the way, the words of the Kaddish prayer heard by Western Wall's stones after 19 years of silence, tears of mourning, shouts of joy, and the singing of "Hatikvah". The narrow pavement, which could accommodate a maximum of 12,000 per day, was transformed into an enormous plaza which could hold in excess of 400,000. The dusty plaza stretched from the wall to the Jewish Quarter. The section of the Wall dedicated to prayers was extended southwards to double its original length from 30 to 60 metres, while the 4 metre space facing the Wall grew to 40 metres. Thus the small pre-1967 120 square metre area in front of the wall became the vast Western Wall Plaza, covering 20,000 square metres. Over the decades the wall has been visited by millions of tourists and pilgrims alike and is often on the itinerary of foreign heads of state who visit Israel. In Judaism, the Western Wall is venerated as the sole remnant of the Holy Temple . It has become a place of pilgrimage for Jews, as it is the closest permitted accessible site to the holiest spot in Judaism, namely the Even ha-shetiya or Foundation Stone, which lies on the Temple Mount. According to one rabbinic opinion, Jews may not set foot upon the Temple Mount and doing so is a sin punishable by Kareth. While almost all historians and archaeologists and most rabbinical authorities believe that the rocky outcrop in the Dome of the Rock is the Foundation Stone, some rabbis say it is located directly opposite the exposed section of the Western Wall, near the El-kas fountain. This spot was the site of the Holy of Holies when the Temple stood. Jewish tradition teaches that the Western Wall was built by King David and that the wall we see today is built upon his foundations, which date from the time of the First Temple . Jewish midrashic texts compiled in Late Antiquity refer to a western wall of the Temple which “would never be destroyed.” Some scholars were of the opinion that this referred to a wall of the Temple itself which has long since vanished. Others believed that the wall still stood and was actually a surviving wall of the Temple courtyard. However, today there is no doubt that the wall is the western retaining wall of the Temple Mount and the Midrash refers to the Temple in its broader sense, that is, the Temple Mount. Jewish sources teach that when Roman Emperor Vespasian ordered the destruction of the Temple, he ordered Pangar, Duke of Arabia, to destroy the Western Wall. Pangar however could not destroy the wall because of God's promise that the Wall will never be destroyed. When asked by Titus why he did not destroy it, Pangar replied that it would stand as a reminder of what Titus had conquered. He was duly executed. There is a tradition that states that when water starts trickling through the stones of the Wall, it is a signal of the advent of the Messiah. Rabbi Zvi Hirsch Kaindenover discusses the mystical aspect of the Hebrew word kotel when discussing the significance of praying against a wall. He cites the Zohar which writes that the word kotel, meaning wall, is made up of two parts: "Ko", which has the numerical value of God’s name, and "Tel", meaning mount, which refers to the Temple and its Western Wall. Jewish sources, including the Zohar, write that the Divine Presence rests upon the Western Wall. The Midrash quotes a fourth century scholar: “Rav Acha said that the Divine Presence has never moved away from the Western Wall”. 18th century scholar Jonathan Eybeschutz writes that “after the destruction of the Temple, God removed His Presence from His sanctuary and placed it upon the Western Wall where it remains in its holiness and honour”. It is told that great Jewish sages, including Isaac Luria and the Radvaz, experienced a revelation of the Divine Presence at the wall. The sages state that anyone who prays in the Temple in Jerusalem , “it is as if he has prayed before the throne of glory because the gate of heaven is situated there and it is open to hear prayer”. Jewish Law dictates that when Jews pray the Silent Prayer, they should face mizrach, towards Jerusalem, the Temple and ultimately the Holy of Holies, as all of God’s bounty and blessing emanates from that spot. According to the Mishna, of all the four walls of the Temple Mount, the Western Wall was the closest to the Holy of Holies and therefore that to pray by the Wall is particularly beneficial. Rabbi Jacob Ettlinger writes "since the gate of heaven is near the Western Wall, it is understandable that all Israel's prayers ascend on high there...as one of the great ancient kabbalists Rabbi Joseph Gikatilla said, when the Jews send their prayers from the Diaspora in the direction of Jerusalem, from there they ascend by way of the Western Wall." A well-known auspicious practice among Jews is to pray for 40 consecutive days at the Western Wall. This custom was apparently conceived by Rabbi Yisroel Yaakov Fisher. According to some, by Late Antiquity the privileged site of Jewish prayer in Jerusalem was located on the Mount of Olives and only towards the end of the Middle Ages did Jews gradually begin to congregate instead at the Western Wall for their prayers, authorized to do so by the waqf authorities. Indeed, most historians believe that the Western Wall became a popular prayer area only after the Ottoman conquest of Jerusalem in 1517. There are, however, recorded instances of the wall being used as a place of prayer before the Ottoman period. The Scroll of Ahimaaz, a historical document written in 1050 CE, distinctly describes the Western Wall as a place of prayer for the Jews. In around 1167 CE during the late Crusader Period, Benjamin of Tudela wrote that "In front of this place is the Western Wall, which is one of the walls of the Holy of Holies. This is called the Gate of Mercy, and hither come all the Jews to pray before the Wall in the open court". In 1334, Jewish traveller Isaac Chelo wrote: "It is this Western Wall which stands before the temple of Omar ibn al Khattab, and which is called the Gate of Mercy. The Jews resort thither to say their prayers, as Rabbi Benjamin has already related. Today, this wall is one of the seven wonders of the Holy City." In 1625 "arranged prayers" at the Wall are mentioned for the first time by a scholar whose name has not been preserved. Scrolls of the Law were brought to the Wall on occasions of public distress and calamity, as testified to in a narrative written by Rabbi Gedaliah of Semitizi who went to Jerusalem in the year 1699. "On Friday afternoon, March 13, 1863, the writer visited this sacred spot. Here he found between one and two hundred Jews of both sexes and of all ages, standing or sitting, and bowing as they read, chanted and recited, moving themselves backward and forward, the tears rolling down many a face; they kissed the walls and wrote sentences in Hebrew upon them... The lamentation which is most commonly used is from Psalm 79: "O God, the heathen are come into Thy inheritance; Thy holy temple have they defiled." Throughout the ages, the Wall is where Jews have gathered to express gratitude to God or to pray for divine mercy. On news of the Normandy landings on June 6, 1944 thousands of Jews went to the Wall to offer prayers for the “success of His Majesty’s and Allied Forces in the liberation of all enemy-occupied territory.” On October 13, 1994, 50,000 gathered to pray for the safe return of kidnapped soldier Nachshon Wachsman. August 10, 2005 saw a massive prayer rally at the Wall. Estimates of people protesting Israel's unilateral disengagement plan ranged from 50,000 to 250,000 people. Every year on Tisha B'Av large crowds congregate at the Wall to commemorate the destruction of the Temple. In 2007 over 100,000 gathered. "Our Holy Temple, which was our glory, in which our forefathers praised You, was burned and all of our delights were destroyed". There is a much publicised practice of placing slips of paper containing written prayers into the crevices of the Wall. The earliest account of this phenomenon is recounted by the Munkatcher Rebbe and is recorded in Sefer Tamei Ha-minhagim U’mekorei Ha-dinim. The story involves Rabbi Chaim ibn Attar who died in Jerusalem in 1743. A certain man came to him in great distress after he had become so destitute that he couldn’t afford to buy food for his family. The Ohr Ha-chaim wrote him an amulet in Ashuri script on parchment and instructed the man to place it between the holy stones of the Western Wall. Another story is told involving a pupil of Rabbi Chaim ibn Attar who planned to emigrate to Jerusalem from Morocco. Attar instructed him to place a note in the Wall upon his arrival. The pupil, who later became known famously as the Chida, attributed his personal success to the note which read “Dear God, please let my student Azulai become successful in Israel”. More recently, the Israeli Telephone Company has established a fax service to the Western Wall where petitioners can send notes to be placed in the Wall. This opportunity is now offered via a number of charitable websites. On March 26, 2000, Pope John Paul II placed a letter in the wall and in 2005, the Israel Postal Authority issued a stamp commemorating the event. 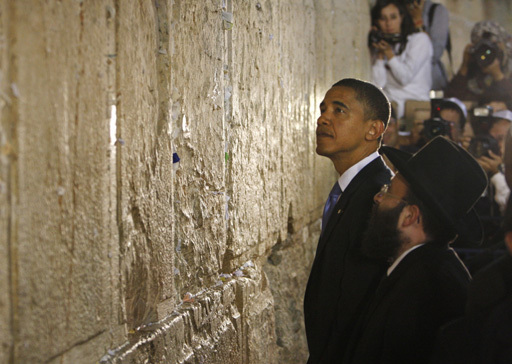 In July 2008, U.S. Presidential candidate Barack Obama placed a written prayer in the wall, which was later reportedly removed and published in the Maariv newspaper. In 2009, Pope Benedict XVI also deposited a message in the wall and also released its contents to the media. More than a million notes are placed each year. The notes are collected twice a year and buried on the Mount of Olives. There is however, much debate among Jewish codifiers about whether it is permitted to place one's fingers inside the cracks of the Wall. Those who warn against such action hold that the breadth of the Wall constitutes part of the Temple Mount itself and therefore retains holiness. Others hold that the Wall stands outside the given measurements of the Temple area and therefore there is no concern about inserting one's fingers into the crevices. Some rabbis have written strongly against having any benefit from the Wall. They write that leaning against it or using it for shade is demeaning to its sanctity. Even to use its cavities for placing prayer books or candles is disapproved of. At one point in the Wall's history, pilgrims, based upon various scriptural verses, would place nails in the cracks and paint their Hebrew names on the Wall. These practices stopped after rabbinic consensus determined that they were a desecration of holiness. Also, in the past it was not uncommon for tourists or those intending to travel abroad to remove a chip from the Wall or some of the sand from between its cracks as a good luck charm or memento. Some rabbis decried the practice as "an evil custom which is totally forbidden." In the late 19th century the question was raised as to whether this practice was permitted and a long responsa appeared in the Jerusalem newspaper Havatzelet in 1898. It concluded that even if according to Jewish Law it was permitted, the practices should be stopped as it constituted a desecration. More recently the Yalkut Yosef rules that it is forbidden to remove small chips of stone or dust from the Wall, although it is permissible to take twigs from the vegetation which grows in the Wall for an amulet, as they contain no holiness. Cleaning the stones is also problematic from a halachic point of view. Offensive graffiti once sprayed by a tourist was visible for months until it began to peel away. Many contemporary poskim rule that the area in front of the Wall has the status of a synagogue and must be treated with due respect. As a sign of respect, men and married women are expected to cover their heads upon approaching the Wall, and to dress appropriately. When departing, the custom is walk backwards away from the Wall. On Saturdays, it is forbidden to enter the area with electronic devices, including cameras, which infringe on the sanctity of the Sabbath. The Yalkut Yosef rules that there is no need to remove one's shoes when standing by the Wall, as the plaza area is outside the sanctified precinct of the Temple Mount. However, there was once an old custom of removing one's shoes upon visiting the Wall. A 17th century collection of special prayers to be said at holy places mentions that “upon coming to the Western Wall one should remove his shoes, bow and recite…”. Rabbi Moses Reicher wrote that “it is a good and praiseworthy custom to approach the Western Wall in white garments after ablution, kneel and prostrate oneself in submission and recite “This is nothing other than the House of God and here is the gate of Heaven.” When within four cubits of the Wall, one should remove their footwear.” Over the years the custom of standing barefoot at the Wall has ceased. In the past women could be found sitting at the entrance to the Wall every Sabbath holding fragrant herbs and spices in order for the worshippers to make additional blessings. In the hot weather they would provide cool water for them. The women also used to cast lots for the privilege of sweeping and washing the paving of the alleyway at the Wall. After the Old City was captured during the Six Day War, the Wall once again became accessible to Israeli worshippers. The large plaza created in 1967 is used for worship and public gatherings, including Bar mitzvah celebrations and the swearing-in ceremonies of newly full-fledged soldiers in the Israel Defense Forces. Chabad activists stationed at the site regularly promote the Tefillin Campaign. Tens of thousands of Jews flock to the wall on the Jewish holidays, and particularly on the fast of Tisha B'Av, which marks the destruction of the Temple and on Jerusalem Day, which commemorates the reunification of Jerusalem in 1967 and the delivery of the Wall into Jewish hands. In 1989, activists belonging to a group called Women Of The Wall petitioned the court to secure the right of women to pray at the wall in organized groups and read publicly from the Torah while donning a tallit. After the 1967 Arab-Israeli war, Rabbi Yehuda Meir Getz was named the overseer of proceedings at the wall. After Rabbi Getz's death in 1995, Rabbi Shmuel Rabinowitz was given the position. Until the 1920s, Muslims referred to the Wall as El-Mabka “the place of wailing". They then began calling it the Al-Buraq Wall . Muslims defend that the Wall is [also] an Islamic endowment site based on two factors: The first is due to the association with the Wall in the Isra and Mi'raj story; some sources identify the Western Wall as the place where the Islamic prophet Muhammad tethered his winged steed, Buraq. The tradition is first referred to in a manuscript by Ibn Furkah (d. 1328) stating that Buraq was tethered outside Bab al-Nab, an old name for a gate along the southwestern wall of the Haram al-Sharif at the very spot presently known as Al-Buraq. Other sources which referred to this tradition date from the 19th century and include the 1840 deliberation refusing the Jews the right to pave the area in front of the wall and the map of Jerusalem by Wilson (1865) that names the area around the Wailing Wall Hosh al-Buraq. The second is based on the claim that it is Waqf property and a part of the Noble Sanctuary . "The Western Wall - all its various parts, structures and gates – are an inseparable part of the al-Aqsa compound...The Western Wall is part of Al-Aqsa's western tower, which the Israeli establishment fallaciously and sneakily calls the 'Wailing Wall'. The wall is part of the holy al-Aqsa Mosque". Most Jews, religious and secular, consider the capture of the wall by Israel in 1967 as a historic event. A poll carried out in 2007 by the Jerusalem Institute for Israel Studies indicated that 96% of Israeli Jews were against Israel relinquishing sovereignty of the Western Wall. However, after the 1967 Six Day War, a small minority of reverent Jews led by anti-Zionist Rabbi Joel Teitelbaum of Satmar would not approach the wall. Rabbi Teitelbaum had written of the prohibition against visiting and praying at the wall since it had been liberated by Zionist soldiers. He asserted that a remnant of the Temple had fallen into the hands of "a foreign occupier," and instructed his followers not to approach it. Till this day, adherents of Satmar and the Neturei Karta sect refrain from approaching the Wall, asserting that it has been befouled by secular interests and those professing Zionism, which they see as an abomination. Avigdor Miller, a non-Hasidic American rabbi, wrote that "the Kosel is better off in the hands of the Muslims due to their modesty more than the Jews who defile the holy place with their Jewish immodesty". Shmuel Berkowitz, in his book "The Wars over the Holy Places", suggests that Muslim attribution of holiness to the Western Wall began only in the last 100 years. He suggests this from the fact that official guides published by the Waqf in 1914, 1965, and 1990 do not attribute holiness to the wall and the entry "al-Buraq" in the Encyclopedia of Islam does not make the connection either. In 2006, Dr. Hassan Khader, founder of the Al Quds Encyclopedia, told PA television that the first connection of the Jews to the Wall is "a recent one which began in the 16th Century...not ancient...like the roots of the Islamic connection". Egyptian Minister of Waqfs, Mahmoud Hamdi Zakzouk, has asserted that the Western Wall is not a Jewish holy site. Another high ranking Egyptian Muslim authority, Mufti Nasr Fradid Wassel, has decreed that the Western Wall remain an Islamic endowment for ever, explaining that it is a part of the western wall of the Al-Aqsa Mosque . He added that the Wall would belong to Muslims all over the world "until the end of earth" and that it is religiously forbidden for Muslims to refer to Buraq Wall as the Wailing Wall.